Holidays in the sun are just as fun as white Christmases. Yes Christmas day sledding is magical, but what about Christmas day beach days? 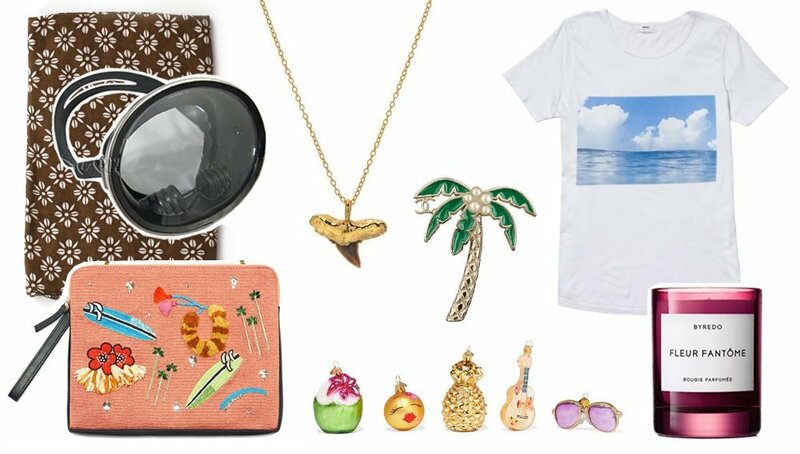 Here’s the ultimate gift guide for someone in your life who is also chasing their summer fashion style. Bombi Getaway Ornaments, match your decorations to the weather outside! Lizzie Fortunato Safari Clutch, it’s so beautiful. All that intricate detail. You can dress it up or down. This clutch is a great summer wardrobe addition. Old School Snorkeling Mask, snorkel in stype — this mask is adorable and will make you look so stylish as you swim around in your endless summer. Acacia Pareo in “Daisy Block”, a perfect beach blanket or coverup, this Acacia pareo has tons of uses in the cutest Jane Birkin-ish print. Bychari Shark Tooth Necklace, what says summer style more than jewelry that comes from the sea? Chanel SS17 Palm Tree Pin, Chanel’s Cuba collection is basically the dream for those of us searching for greater summer fashion style. This pin is particularly perfect. Mikoh Cloud Tee, throw it on to go to the beach, throw it on to go to lunch, throw it on to go to dinner. Mikoh‘s t-shirts are soft and convertible, a lot like their bikinis! Byredo Fleur Fantôme Candle, a floral fragrance in a pink vessel is too summery to pass by!